Total loss occurs when the cost of repair of a vehicle exceeds a certain amount. It’s a situation where it makes more sense for the insurer to pay the pre-accident value of the damaged vehicle rather than repairing it. When is my vehicle Totaled? What is my vehicle’s salvage value? It’s what the damaged metal is worth. This amount is normally provided by the salvage auction and is the average of what similarly damaged vehicles have sold for in the past. What’s my vehicle’s actual cash value? This would be the amount your vehicle was worth prior to the accident. Who calculates my cash value? Insurance carriers generally use valuation services to assess the value of your vehicle. CCC, JDPower Mitchell, and Audatex are the largest providers of valuation services. How do I get my cash value appraisal? Insurance companies must give you the valuation or appraisal report they used to determine your vehicle’s value. Insurance Total Loss Report Sample. Is the cash value appraisal negotiable? YES. If you believe your vehicle is worth more, you must prove a higher value. This is usually done by providing the carrier with an alternate report. How can I order an alternate appraisal? Contact a legitimately licensed auto appraiser, we charge $175 for a vehicle valuation report. Will the insurance company recognize my appraisal? Yes, as long as the appraiser issuing it is licensed and competent. Does my appraiser need to inspect the vehicle? Not unless we are disputing the condition and equipment listed on the insurer’s report. Do I have to pay upfront for an appraisal or after the settlement? We process appraisals AFTER full payment is made. We also do not offer refunds. Can I get a Free Estimate for Total Loss before ordering the report? Yes, we offer a $75 claim review. Click here to order a total loss claim review. Would you negotiate a claim on my behalf, and if so, is there an added cost? Yes, on first party claims (against your own carrier), we will communicate with the other appraiser and reach an agreement. The cost of this service is an additional $125. What does the Law Say in Georgia? umpire. The umpire is a third appraiser. Not sure if the insurer is offering you a fair deal? 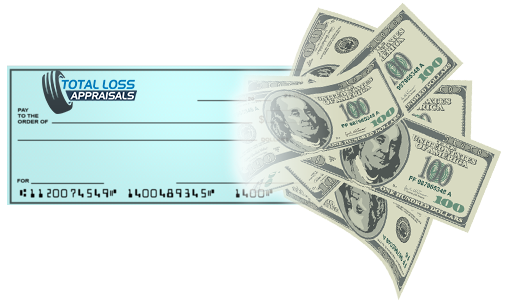 Fill out the form below and order our Total Loss claim review. This will be the best $50 you'll ever spend. Enter special instructions or comments to our appraiser. I have read and agree with the terms of service listed above and I am aware that there are no refunds allowed on claim reviews.